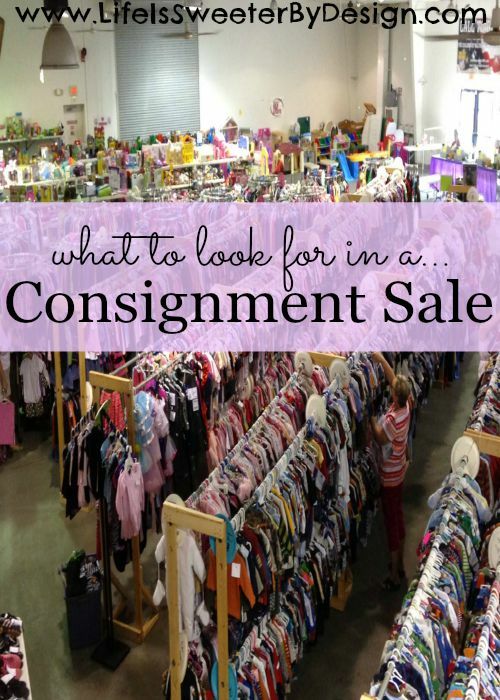 There are more and more large children's consignment sales cropping up and it can be hard to know what to look for in a consignment sale if you are a new consignor. I have been actively consigning and shopping at consignment sales for the past 12 years or so. I got started when my cousin told me about a sale she liked selling her baby items at….I went once and was hooked! I will save my reasons for why you should shop at consignment sales for another post and focus on what to look for in a consignment sale. As more and more consignment sales crop up it can be hard to know which ones to get involved with. If you are planning to consign items you need to realize that it can be a big time investment to prepare all of your items. You don't want to put a ton of time in and then realize the sale was not worth it! If you are new to consignment sales or you are thinking about consigning at a sale you haven't worked with before….SHOP THE SALE first! Shopping at the sale will tell you a LOT about the sale and the owners. You can see what kind of merchandise is moving, how organized the sale is, how other parents are pricing items, etc. Shopping the sale will tell you if it is a sale you want to consign with. If you want to go ahead and jump in consider consigning a smaller amount of items to get your feet wet at the sale so to speak! The owners of the sale must be organized. You should be able to get some idea of their organizational skills in the weeks and months leading up to the sale. Regular email communication, an easy to use website, etc. will give you a look at their skills in this area. Is the actual sale organized? Do they have things set up in an efficient manner that will promote sales? Do they have easy processes in place for check in, check out, etc.? It is okay to ask the owners of the sale what some of their numbers are for previous sales. How many shoppers did they have at the last sale? What percentage of items that were consigned actually sold? These numbers will tell you if it is a popular and successful sale. Small sales can be great as long as they have loyal shoppers who buy! The key is that people are actually attending the sale and buying. It is also okay to ask any clarifying questions about how the sale works, especially if it is your first time! If you are consigning items you need to know that the time you invest prepping your items will be worth it. You need to know that the drop off/check in process is easy and quick. You will want to know how much and when you will be paid. How do you get your items that don't sell? These questions should all be clearly covered on the sale's website or in the information the owners give you. Make sure you get the answers before you leave your valuable items at the sale! I have had items rejected almost every time I have consigned. It doesn't hurt my feelings or upset me at all! The lighting in my house is not as good as the lighting in the building where the sale is held. They may see a stain or issue with an item that I missed. IT IS OKAY! I do not like going to a sale and seeing lots of items that belong in a garage sale…stained, ripped, bad condition. If the sale allows poor quality items…the whole sale will suffer! People come to these sales to find high quality children's items for a great price. The sale will lose shoppers and everyone will lose money! If the sale doesn't have a policy on what they will accept….I would advise you to find another sale! I am lucky that there is a wonderful sale in my area. It is the first sale I attended and I am still an active participant in this sale! Britches and Lace, LLC is a sale held in Andover, Kansas twice a year and it is hard to beat! The 2 ladies who run the sale are kind and wonderful women and it shows in how they conduct their business. They truly care about the consignors and the shoppers! If you live in the Wichita area I highly recommend you look into consigning at Britches and Lace! You can go HERE to sign up to be a consignor and I would love it if you mentioned that I referred you! You only have to consign 4 items in order to shop the sale early and get the best deals! You can check out Britches and Lace on Facebook to stay up to the minute with all the latest on their fall and spring sales! There are LOTS of ways to increase your earnings, get in to the sale early for shopping, etc. These gals run a very organized sale and I find great deals every year! !